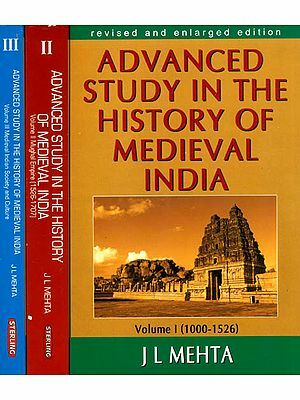 A Comprehensive History of Medieval India presents a consolidated timeline of medieval India by taking into account the period that marked the end of ancient India, and focusing on the importance of the transitory centuries when Delhi had begun to surface as the new power centre, triggering prominent trends in thought and institutions. This book analyses the nature of social forces, complexity of causation and the interdependence of change and continuity in the light of the crucial transition from ancient to early medieval India, with the emergence of the Delhi Sultanate and the Vijayanagar-Bahmani kingdoms. 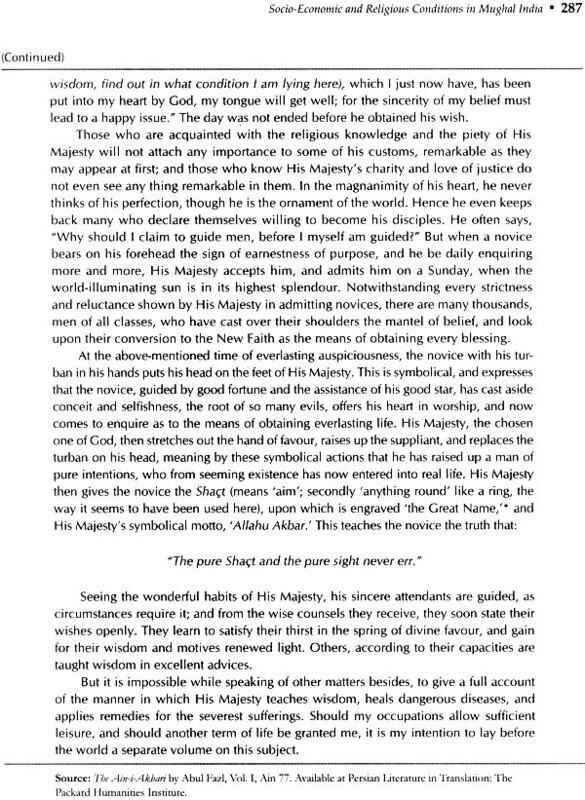 Proceeding to detail the most effervescent period in Indian history-the era of the great Mughals-the text provides an insight into the ideological-philosophical basis of the times, focusing on the Sufi and Bhakti movements, and culminates with the rise of the Marathas, the advent of European companies, and the eventual establishment of the British in Bengal. Keeping in mind that the history of medieval India has not moved in a linear fashion, and that much of the period saw phases of expansion and realignment of political attributes, this book contributes to a deeper understanding of the much misread period of Indian history with a view that takes into account the resultant interface between the political, social, economic, religious and cultural elements L\I1d devotes to this crucial period the attention it deserves. Salma Ahmed Farooqui is Associate Professor of History at the Directorate of Distance Education, Maulana Azad National Urdu University, Hyderabad. A gold medallist from the University of Hyderabad and an UGC-JRF/SRF awardee she completed the MPhil and PhD programmes in History from the same university. She then proceeded to finish a post-doctoral fellowship awarded by the K. K. Birla Academy, Division of Historical Research, New Delhi. She has also worked with ICFAI University. Her resolve to look at the past afresh with a questioning mind has led to several research publications which include two books, Islam and the Mughal State and Multicultural Dimensions of Medieval Deccan, and several papers. Her presentation of papers at many 1i.ational and international seminars and conferences include one at the University of Cambridge, UK. She was also selected for the Study of the United States Institutes Program on Religious Pluralism hosted by the University of California, Santa Barbara, USA. The study of medieval Indian history has engaged both scholars and students over the last two hundred years in India and elsewhere. Its understanding and interpretation illustrates the nature of social forces, complexity of causation and the interdependence of change and continuity. Whenever a book on medieval Indian history is written and read, a connection needs to be established between the reading of the text and its multi-layered historical perspective that encompasses the political, social, economic and cultural contexts. A Comprehensive History of Medieval India assesses the entire medieval period-twelfth to the mid-eighteenth century-from multiple perspectives, enabling the reader to build connections and form new ideas. The primary objective of this book is to aid students in becoming active historians, and scholars to refresh their memory and generate fresh views on the progression of medieval Indian history. Keeping this in mind, the book has been designed to appeal to a wide audience and to give this crucial period of Indian history the attention it deserves. Organized into eight parts, the thirty-three chapters of approximately equal length begin with an introductory part on the crucial transition from ancient to early medieval India. The parts on the Delhi Sultanate, Vijayanagar-Bahmani kingdoms and the Mughals proceed chronologically to the Marathas, and the advent of European companies to the establishment of the British in Bengal depicting the unfolding of the developments as they occurred during this entire period. In-between these parts, a section on religious thought provides an insight into the ideological-philosophical basis of the times, focusing on the Sufi and Bhakti movements. The chapters in themselves follow the course of medieval Indian history in chronological order so that the reader learns to grasp the essential direction of events as they led from one to another. 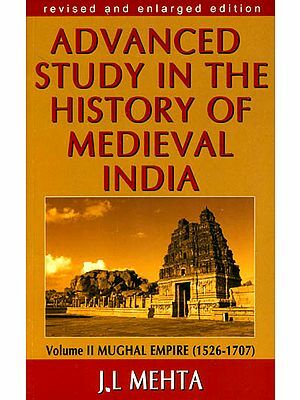 The history of medieval India as a topic for investigation may appear curiously anachronistic at a time when historians are less preoccupied with the history of personalities or the grand narrative of dynastic changes. History writing has now moved towards the analysis of institutions and structures. It often attempts to explain micro historical studies in certain regions at a given time. The ability of the medieval Indian state to adapt to the new forms of governance that emerged during a long span of time makes this task not without its benefits. It needs to be kept in mind that medieval India’s history has not moved in a linear fashion. The resultant interface between the political, social, economic, religious and cultural elements has shaped the historical processes at work. Much of the period saw phases of expansion and realignment of political attributes lending the medieval Indian state a distinct character. In this light, this book seeks to integrate the general with the specific, thus contributing to a deeper understanding of the much misread and often bypassed period of Indian history. 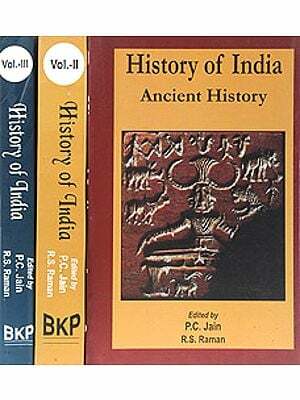 Conventionally, the history of medieval India comprises a timeline between the twelfth and the eighteenth centuries. But, there are some historians who include the time between the eighth and the eleventh centuries in the medieval period and term it as the early medieval period. The early medieval period, historians say, forms the entry point of certain Significant trends into the Indian society that began leaving a noticeable impact on the Indian way of life. In Indian history the entire ‘medieval period’ is often equated with the ‘Muslim rule: In such depictions the arrival of the Turks is regarded as the beginning of the Muslim conquests and the period starting from the twelfth century till the onset of the modern age is classified as the Muslim period. This kind of portrayal is the result of a number of misconceptions which historians now recognize as conventional and orthodox representations. Sadly, in spite of new insights into medieval history, such views continue to find place in the political parlance of modern religious nationalism and influence our perception of identities. In the early medieval period, the Rajputs belonging to north India were floating around restlessly looking for a home before finally settling down in the Rajputana (mostly today’s Rajasthan) area. Then, they pushed themselves into the political arena and established numerous small monarchical kingdoms. In addition to these fiefdoms, large states arose elsewhere in India between 750 CE and 1000 CE-the Palas in eastern India, the Pratiharas in western India and the upper Gangetic valley, and the Rashtrakutas in the Deccan. The feudatory pattern of relationships played a key role in the political and economic developments of those times and also in the rise and fall of small and big kingdoms. It also made these states incapable of withstanding the foreign invasions. In the absence of a paramount power in the country, it was comparatively easy, first, for the Arabs in 712 CE and a hundred years later for the Turks who had settled down in what is today known as Afghanistan to undertake expeditions into India. The Turks, a Central Asian people, later led conquests beyond the frontiers of India and from thence advanced into the Indian mainland. By the beginning of the twelfth century, Delhi with its strategic location had begun to surface as the new power centre from where the fresh entrants marched into the fertile Punjab and the Ganges valley. What emerged from there was a period in Indian history that triggered prominent trends in thought and institutions. It is during this period that the Arabs, Afghans, Turks and Persians gained a firm foothold on the Indian soil and made it their permanent abode. Islam’s advent into India in the eighth century, first as a religion and then as military force, and its firm establishment by the eleventh century as a political power in the northern regions, gave rise to a culture as complex as the pressures exerted on it. This long period of advancement and interaction started to flourish and assume leadership making a mark by its intrusive centralization, novel institutions of statecraft and different norms of governance. The new leadership manifested itself through vital developments, such as the expansion of population, agriculture, trade and towns. Reforms in religion and the development of literature, art and architecture was to continue for the next several centuries. The foreigners brought with them a new faith, hitherto unknown military practices, love for gardens and lakes, passion for building palaces, forts, mosques and other kinds of structures, fascination for delectable foods, ideas and philosophies, and traditions and customs that India had never been through in the past. In the beginning, the two sets of what broadly could be called civilizations resisted influence over each other, sometimes bitterly in wars. But with time this reluctance gave way to experiment, adjustment and then to understanding and acceptance of the inevitable progression of history. 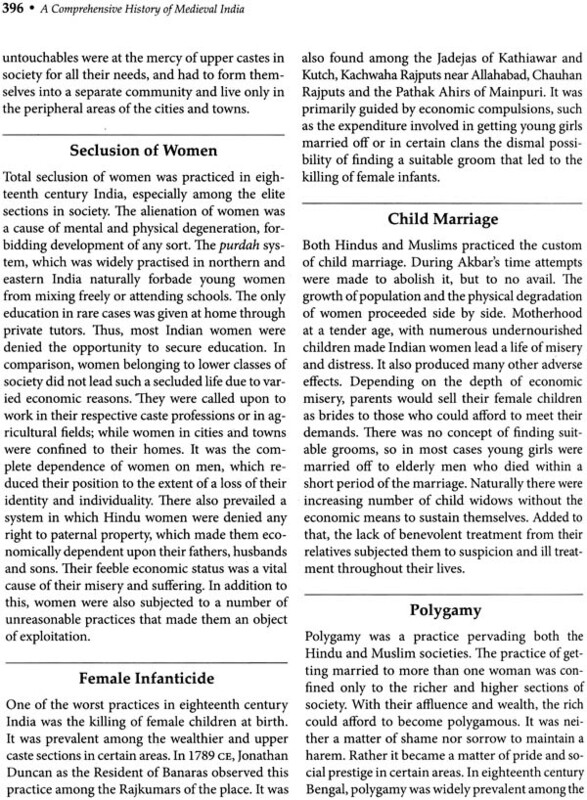 Let us first analyse the changes that came up in the Indian society with the coming of Islam to India. Al-Beruni was perhaps the first historian to use the word Hindu to refer to the people living in Hindustan who comprised a religious group different from the Muslims. It is important to understand that the term ‘Hindu’ as referring to a religious denomination was rare until medieval times when it began to be used to refer to a community with its own way of living. Since the eighth century, Islamic traditions were introduced into India by traders, warriors, Sufis and travellers of different ethnicities. Interaction between the two culturally diverse traditions has often been represented in terms of tension between the ‘Turk’ and the ‘Hindu’, both conceptualized as being monolithic and static with conflicting ways of life. But it was not so. The process was definitely difficult for a society that was witnessing a sudden transformation as a result of military, political, racial, religious and regional conflicts. However, the quotient of adaptability and resilience went beyond the skirmishes naturally evolving exchanges in cultural assimilation and synthesis. The Arabs had been trading with the people of Malabar since the pre-Islamic days. After the revelation of the message to the Prophet, the Arabs became Muslims, and many of them married local women whose children went to live in different parts of the region. On the other hand, Islam came to North India through the invasion of Sind by Muhammad bin Qasim in 712 CB. Later, when Arab rule weakened in Sind, the Persianized Turks and Afghans uprooted by the Mongols from their homeland in Iran and Central Asia established their presence as rulers in much of north India from the twelfth century onwards. The new military technology used by Mahmud of Ghazni and Muhammad of Ghur in the form of the crossbow while at the gallop gave them a decisive advantage over their Indian opponents, the Rajputs, who ultimately collapsed in the face of the swift cavalry of the Afghans and Turks. In the thirteenth century, Iltutmish, a former slave-warrior, established the Delhi Sultanate, which enabled future sultans to push their way forward in every direction. Within the next hundred years, the Delhi Sultanate extended its sway east to Bengal and south to the Deccan, while the Sultanate itself experienced repeated threats from the northwest and internal revolts from displeased, independent-minded nobles. The Sultanate was in a constant state of flux as five dynasties rose and fell-the Slaves or Mamluks, the Khiljis, the Tughlaqs, the Sayyids and the Lodis. 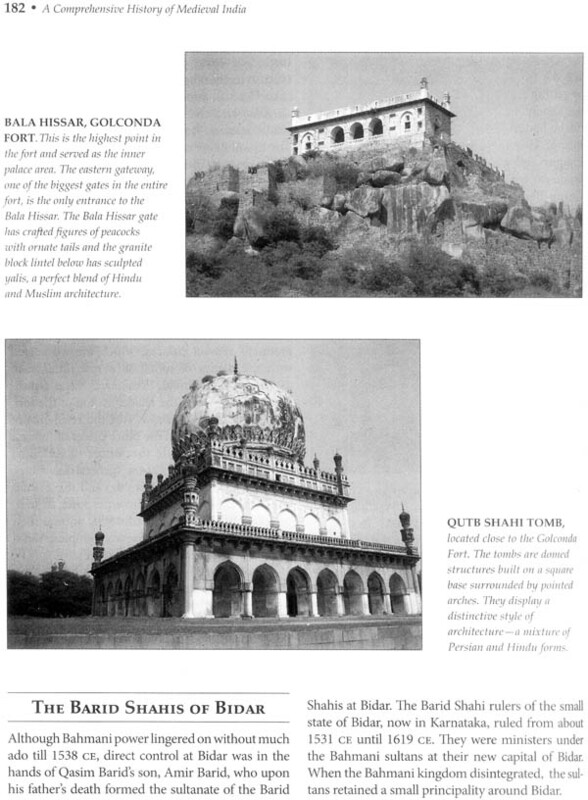 The remains of these kingdoms are still visible in Delhi and elsewhere around North India. Even as the upheaval in the North continued, other sultanates were being established in the Deccan and South India. The south had begun to exercise an increasing fascination over men from north India as well as those from Persia who got an opportunity to travel and survey areas hitherto unknown to them. Powerful states such as Vijayanagar, based on Brahmanical political traditions of dharma, the Bahmanis, and smaller Muslim sultanates emerged in the Deccan and Far South. Not surprisingly, there was travel and exchange of diverse ideas, traditions and cultures between the north and the south. 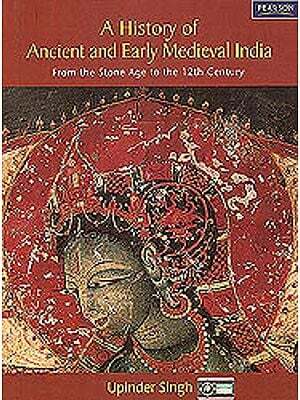 Medieval India was beginning to witness the many syncretic and inclusionist dimensions of Indian cultures. Those were times when Muslims fought against Muslims and Hindus against Hindus in their struggle for power. The Delhi sultans were finally replaced by the Turko-Mongol reign of the Mughals in North India, under whom India once again achieved a large measure of political unity. The Mughal Empire set up by Babur in the sixteenth century continued to rule effectively till the eighteenth century. 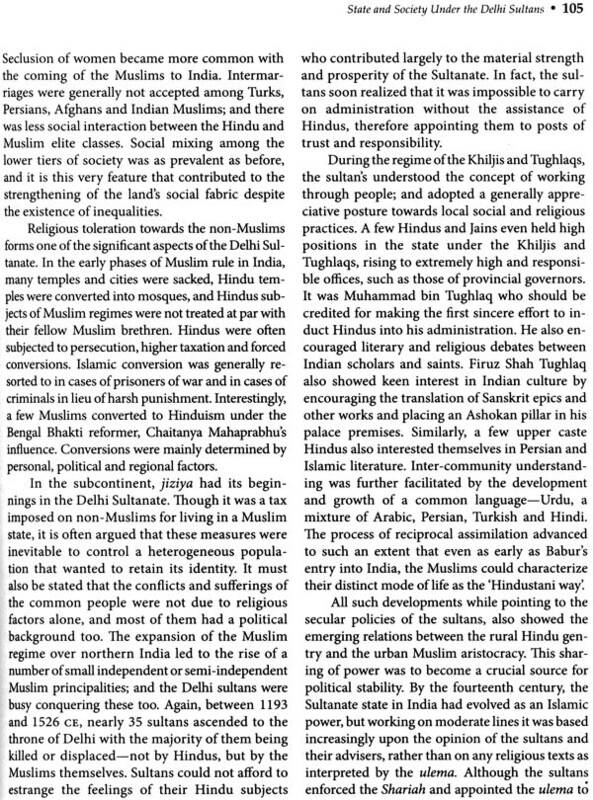 The Mughals brought about integration and harmony in the Indian society. They established a vast empire, which became the envy of the world in terms of power, prestige and prosperity. Rising in the seventeenth century against the central authority of the Mughals in quest of autonomy were the Marathas under Shivaji. They succeeded in de stabilizing, to a large extent, the Mughal Empire that continued to linger on till 1857. Even before the Mughal-Maratha conflict gained intensity, the Europeans had already arrived on the Indian shores as merchants. Their presence dates back to the early sixteenth century. The Portuguese merchants were followed by the Dutch, the English and the French. Among them, the English and the French went on to become giant maritime powers. As the Mughal Empire began to disintegrate in the latter part of the seventeenth century it paved the way for regional powers to contest for supremacy. The turmoil in India provided the Europeans with the opportunity to play one regional power against the other, as it suited their vested interests. In those series of conflicts, the English emerged victorious, beginning their rule with the conquest of Bengal. British imperialist rise in India saw the Muslims standing shoulder to shoulder with their Hindu compatriots in a fight for freedom against the foreign rule. While writing this book what came to mind is that there are a few simple yet thought provoking terms which need a re-look in terms of understanding and usage. Often one finds that certain terms have been used in medieval Indian history recklessly, sometimes giving one meaning and some giving yet another in different situations. Therefore, an attempt has been made to draw a distinction and correct the misusage that has gone unnoticed so far. For instance, in this book the term ‘empire’ has been used only to refer to the Mughals and the British. All the other powers, such as the Delhi Sultanate, Bahmanis, Vijayanagar and Marathas have been referred to as kingdoms. In doing so, the justification lies in the fact that an empire is the domain ruled by an emperor within which there are a group of countries under a single authority. The territory or countries under the jurisdiction and dominion of an emperor (rarely of a king) are usually of greater extent than a kingdom: always comprising a variety of nationalities and forms of administration in its constituent and subordinate portions. 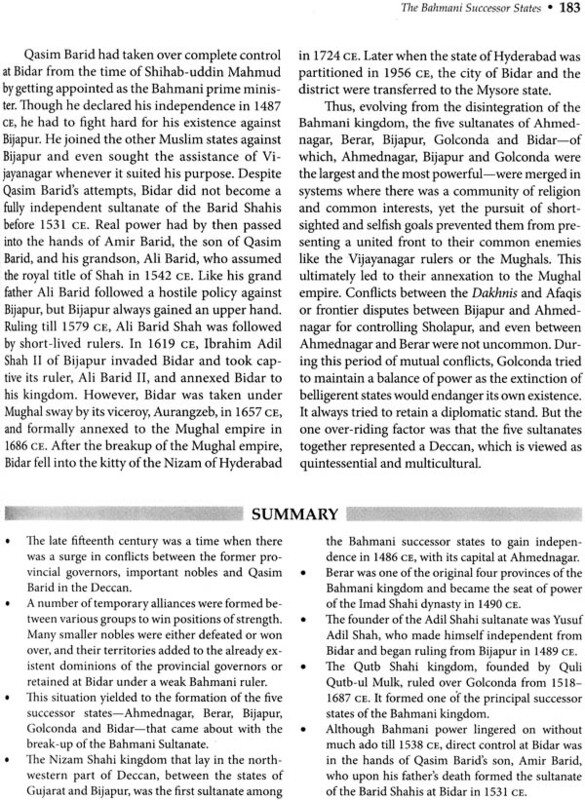 Here, it is important to remark that the kingdoms of Alauddin Khilji and Muhammad bin Tughlaq although stretching from the north to the south of India could not become empires as they merely unified India politically, but could not achieve the degree of potency that is necessary to keep it intact for long. A kingdom, on the other hand, was basically a monarchy, whether big or small, ruled by a king or queen who exercised control. A sultanate or a rashtra had the stature of a kingdom. But both the empires and the kingdoms in medieval Indian history were sovereign states having the same features that comprise statehood, such as population, territory, sovereignty and government. 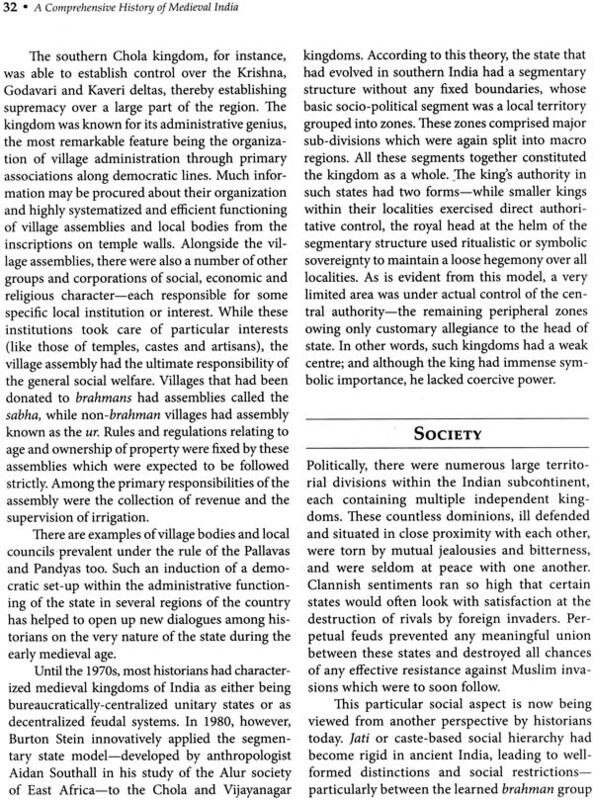 The state in medieval India other than being a functional structure was made up of specific activities and ideas of individuals who comprised it. This encouraged an alternative approach to kingship that focused on the activities of the royal court. In view of this, the king’s court not only symbolized the state but the activities of the court were the activities of the state. Now, a small note of clarification on the terms English and British in Indian history. English is a term used for the people of England while British includes people from England, Scotland and Wales together forming Great Britain. The earliest Englishmen to come into India were the English merchants who had formed themselves into a company to trade with India. They obtained a charter from Queen Elizabeth, the ruler of England, and named their company ‘The Company of Merchants of London trading in the East Indies’ From this small beginning the Company evolved into ‘The English East India Company’.Similarly, more or less at the same time and a little before the forination of the English East India Company, the Portuguese, the Dutch and the French had formed their respective East India Companies. These companies were formed initially for pursuing trade with the East Indies, thus, deriving their name, but ended up trading with the Indian subcontinent and China. Until t conquest of Bengal, as a result of the battles of Plassey and Buxar in 1757 CE and 1764 CE, the English had not established themselves politically in India. It was only then that more people belonging to different stocks of Great Britain came into India as administrators and soldiers. This aspect makes the use of the term ‘British’ politically correct and suitable from then onwards in Indian history. Setting aside clarifications, let us look at the generic evolution of interesting terminology in medieval Indian history whose usage has made them identifiable with the particular period alone. jiziya, a term used to refer to a poll tax, was a tax made payable by non-Muslims known as zimmis living in a Muslim state. Iqta, the forerunner of the jagir, was the piece of land allotted by the Delhi sultans, in lieu of salary to the iqtadar, a nobleman, for collection of land revenue in the non-crown lands and for maintaining troops which could be utilized by the sultan. Almost all civil and military officers of the Sultanate were iqtadars. The iqta system was established to relieve the state treasury when insufficient tax revenue and little booty from campaigns made it difficult for the government to pay army salaries. Later, came the terms mansabdari and jagirdari which referred to the two main institutions of the Mughal Empire and embraced both civil and military sectors of administration. The system was developed to create a centralized administration as well as aimed at raising a large force. The large forces of the mansabdars were used to expand the empire and administer it effectively. Like the iqtadars during the Delhi Sultanate, the mansabdars were paid in Mughal India through the assignment of jagirs. The jagirdari system as an institution was used to appropriate the surplus from the peasantry. At the same time, it was used for distributing the revenue resources among the ruling classes. This military-fiscalism as an important feature in the political traditions of medieval India along with paternalism and absolutism formed the basis of medieval Indian state- craft. 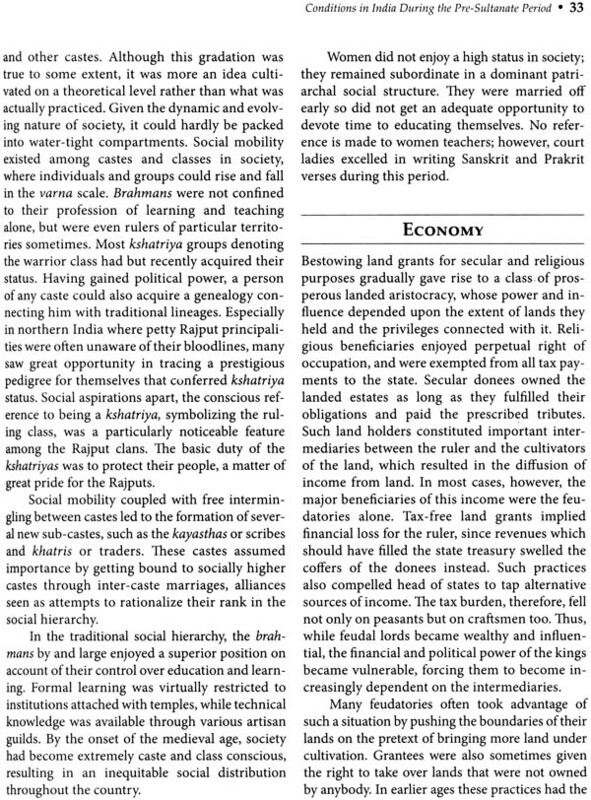 Akin to jagirdars in nature of responsibilities, were the zamindars, who invariably squeezed between the jagirdars and the rural peasantry and were the landowning class with full proprietary rights over land. More generally in north India, the zamindar denoted the cultivator of the soil or joint proprietors holding village lands. In Bengal, the word denoted a hereditary tax collector who could retain a percentage of the revenue he collected while in the Maratha territories the name was generally applied to all local hereditary revenue officers. In the late eighteenth century, the British government made these zamindars landowners, thus creating a landed aristocracy. A peculiar system put in place as a result of these manifestations was that of revenue farming-a system in which the right to collect revenue was given as a franchisee under license from the state to a category of persons known as revenue farmers. Thus, the political map of medieval India was made up of myriad kingdoms with fluctuating boundaries during the long span of 700 years when the Hindus and Muslims mingled, created a new Indo- Islamic sub-civilization and left an indelible mark on South Asia, specially the Indian subcontinent. History Of Medieval India "Sultanate Period And Mughal Period"